The asteroid being explored by the Japanese mission Hayabusa2 is a “rubble pile” formed when rocks were blasted off a bigger asteroid and came back together again. Meanwhile, the team behind the Osiris-Rex mission have made the first close-up observations of particle plumes erupting from an asteroid’s surface. Their findings are published in a suite of papers published in Nature’s journals. The identification of Ryugu as a rubble pile asteroid comes from measurement of its density. Project scientist Sei-ichiro Watanabe said the asteroid’s porosity – a measure of the voids, or spaces, present in the object – was 50%. The large number of rough boulders on Ryugu’s surface support this idea, he added. These boulders are probably fragments that joined up after the disruption of its parent body. The spinning top shape, Dr Watanabe said, “was formed from a past rapid rotation”. Analysis of the reflected sunlight from Ryugu shows it is a close match to two larger asteroids, known as Polana and Eulalia. These are good potential candidates for the asteroid’s parent body. 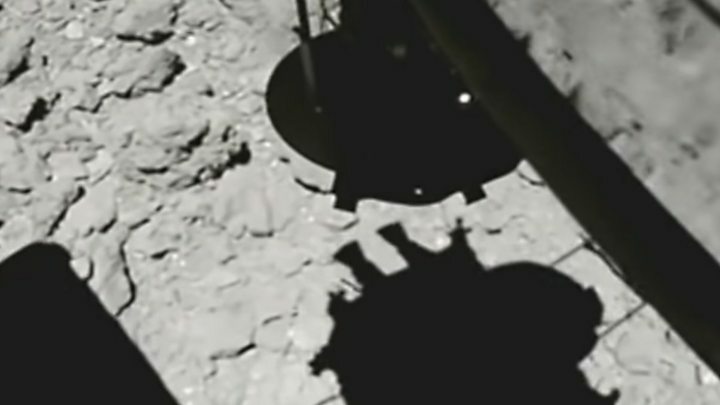 “The surface of Ryugu is extremely dark,” said Ralph Milliken, a co-investigator on the NIRS3 instrument from Brown University in Rhode Island. “There is evidence for water on Ryugu, but we do not have any strong evidence yet for the presence of molecular water, H2O,” said Ralph Milliken, a co-investigator on the NIRS3 instrument from Brown University in Rhode Island. At Bennu, the team behind Osiris-Rex detected plumes of material erupting from the asteroid on 6 January this year. The immediate cause isn’t clear, but it could be related to volatile gases that escape from the rock when sunlight heats them up. This would push the dust out into space. Bennu also appears to be a rubble pile asteroid, and, like Ryugu, was much more rugged than expected – posing a hazard for sample collection. Although there was no way to confirm if Hayabusa2 had collected a sample, project manager Yuichi Tsuda said the team was confident it had, judging from the large amount of material kicked up after the spacecraft fired a 5g tantalum “bullet” into Ryugu’s surface. During the touchdown operation, Hayabusa2’s thrusters shifted 50cm-1m rocks, Yuichi Tsuda said. The thrusters also blew away the top layer of regolith, revealing darker material underneath. Mission scientists have also set a date for Hayabusa2’s next set piece: the kinetic impact experiment. This will involve the spacecraft detonating an explosive charge near the surface of Ryugu – generating an artificial crater. The spacecraft will move to the other side of Ryugu for safety when the charge goes off, returning later to grab a sample of rock from within the crater. The idea is for Hayabusa2 to get at pristine samples from below the surface, samples that haven’t been altered by aeons of exposure to space.